Last week, the Google Earth Outreach and Google.org teams, in collaboration with the Global Canopy Programme, hosted partners from non-governmental organizations (NGOs) for the first gathering of the Community Forest Monitoring Working Group. The goals of the working group are to provide a platform for groups engaged in community forest monitoring activities - across continents - to share knowledge and experience. Equally important is for these groups to provide recommendations for the development of tools, methodologies, and common protocols. For example, the Surui tribe in the Brazilian Amazon is using modern technology to implement their community’s Surui Carbon Project. This effort isn't isolated, as many NGOs and stakeholders support community-based approaches to forest monitoring for their efficiency, cultural relevance, and reliability. Community Forest Monitoring will play a role in the United Nations’ Reducing Emissions from Deforestation and Forest Degradation (REDD+) effort which aims to incentivize developing countries to adopt a low-emission path to development. In thinking about best methods for data collection, this working group is tackling a host of data collection issues including usability, security, accountability, cultural relevance, and scalability. These are all concerns that the team at Open Data Kit (ODK), an open source suite of data collection tools, have fleshed out and iterated upon. 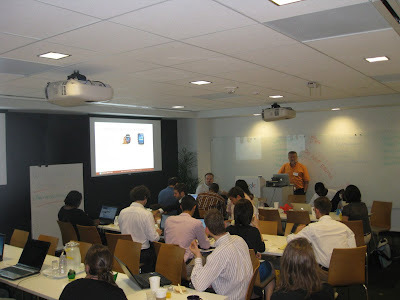 ODK was born in 2008 as a Google sabbatical project of University of Washington computer science professor Gaetano Borriello. Borriello wanted to take advantage of Google’s data collection tools: maps, visualization, databases and has said that his team saw a gap in mobile data collection. Thus, Borriello’s team developed ODK Build, ODK Collect, and ODK Aggregate, mobile tools that have attracted thousands of users and dozens of active developers. As ODK iterates and evolves, the Public Sector Engineering team is learning about the challenges and opportunities in mobile data collection and exploring how we can contribute to this space. ODK already gives users the option to visualize data in Google Earth and Google Fusion Tables, and we are exploring how to take advantage of some of Google’s other tools (what if photos collected on the ground could be easily posted to Picasa, or videos to YouTube?) It’s our goal to make sure that all meaningful data is effectively organized and made discoverable, accessible and usable. Ultimately, community forest monitoring represents just one slice of the potential that effective data collection tools create. ODK was initially motivated by the needs of community health workers and has proven flexible enough to be used to track everything from human rights violations in the Central African Republic to water quality in Ghana. As the nature of scientific research diversifies and the volume of data collected increases, reliable, flexible, and lightweight tools will become more and more crucial. What’s next? As the engineering teams continue to work on improving mobile data collection tools, this working group will convene policymakers at the next workshop to discuss standards and best practices. “The greatest barrier isn’t a technological one, but the challenge of leveraging this data so that communities can help ensure better governance for their forests,” says Niki Mardas, Head of Strategy and Communications for the Global Canopy Programme and theredddesk.org. As with many other public data collection efforts, it will become the job of advocates and analysts to shape meaningful narratives and press for the change the world needs. We're proud to be playing a part in this effort and we're committed to working with our partners to transform data collection from a passive, closed process into an active and empowering one. initiative and have invested in several clean energy companies and projects around the world. (AWEC) in Tehachapi, Calif. by providing another $102 million to finance the 168 MW Alta V Project. This adds to the $55 million we invested last month for the 102 MW Alta IV project. Citibank is joining us again to invest in Alta V.
We are particularly excited about AWEC because it will be one of the largest wind energy centers in the world, with over 1 GW of production scheduled to be on line by the end of the year and 1,550 MW when fully completed. It’ll deliver that energy using the Tehachapi Renewable Transmission Project (TRTP), one of the first and largest transmission projects developed specifically for clean energy. As we noted before, the energy produced at AWEC will be sold to Southern California Edison under a power purchase agreement signed with the developer, Terra-Gen Power, in 2006. So we won’t be purchasing any of the energy produced at Alta V. Rather, we’re investors and will be using the same innovative leveraged lease financial structure we used for Alta IV, meaning Google and Citibank will own Alta V and lease it back to Terra-Gen, who will manage and operate both projects under long-term agreements. It’s a financial structure that we hope will encourage new types of investors to consider investing in wind. With these two projects, we’ve now invested $157 million in 270 MW of clean, wind energy generation at AWEC. That brings our total invested to more than $780 million, with approximately $700 million invested this year alone -- all in projects that not only provide us attractive financial returns but also help to accelerate the deployment of over 1.7 GWs of clean renewable energy. Today, we’re increasing our investment in the Alta Wind Energy Center (AWEC) in Tehachapi, Calif. by providing another $102 million to finance the 168 MW Alta V Project. This adds to the $55 million we invested last month for the 102 MW Alta IV project. Citibank is joining us again to invest in Alta V.
Imagine sitting on your patio watching the sun’s rays pass overhead, knowing that they power your home with clean energy—at a cost that’s less that what you would have paid using just the grid. That’s what my colleague, engineer Michael Flaster, has been doing at his home in Menlo Park, Calif. since March of this year. He did it with the help of a company called SolarCity, which enables homeowners and businesses to begin using solar energy to power their homes and buildings. Today, we’re announcing that we’ve investing $280 million to create a fund that will help SolarCity finance more solar installations across the country. This is our largest clean energy project investment to date and brings our total invested in the clean energy sector to more than $680 million. We’ve also launched a partnership to offer SolarCity services to Googlers at a discount. In SolarCity’s innovative financing model, the company covers installation and maintenance of the system over the life of the lease. 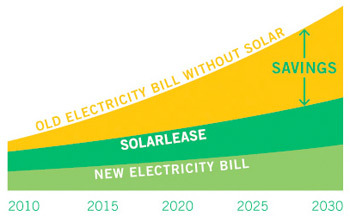 You can prepay, or pay nothing upfront after which you make monthly solar lease payments. All told, Michael will save $100 per month on his energy bills this year, and more than $16,000 over his 15 year lease, after factoring in his lease payment and lower energy bills. We believe the world needs a wide range of clean energy options in the future, each serving different needs. We’ve already invested in several large-scale renewable energy projects, so we’re excited that this new partnership with SolarCity helps people power their homes directly with solar energy, too. We think “distributed” renewable energy (generated and used right at home) is a smart way to use solar photovoltaic (PV) technology to improve our power system since it helps avoid or alleviate distribution constraints on the traditional electricity grid. Our investment is a quadruple-win for Google, SolarCity, its new customers and the environment. We continue to look for other renewable energy investments that make business sense and help develop and deploy cleaner sources of energy. Whether harnessing the sun on rooftops like Michael’s or in the desert sands of the Mojave, it’s all part of building a clean energy future. We’re excited to see that momentum continue. This morning the White House announced a series of measures aimed at making energy data accessible to consumers. Part of a national effort to modernize the nation’s electricity grid, the plan calls for ensuring people can access their energy data in “consumer-friendly and computer-friendly formats” and includes measures to track progress, assistance to states to implement data access policies, and funds for supporting smart grid innovation. Today’s announcement comes on the heels of bipartisan legislation introduced by Senators Mark Udall and Scott Brown that would ensure consumers can access digital information generated from “smart” electricity meters. Data centers are very important to us—they’re critical to the cloud services we deliver. Over the last 12 years, we’ve put a lot of effort into minimizing the amount of energy, water and other resources we use—because it makes financial sense, and because it’s good for the environment too. That work means that today, we use half the energy of a typical industry data center. Last week, we brought together more than 150 industry professionals in Zürich, Switzerland for our second conference on data center efficiency. Since our first conference two years ago in the U.S., the industry’s come a long way, with large operators now very focused on energy efficiency. With “free cooling” we can dramatically reduce energy consumption by using the local environment to cool servers, instead of energy-intensive chillers. In our data centers we use both air cooling and evaporative cooling—and we revealed the details of the seawater cooling system we’ve custom-engineered for our new data center in Hamina, Finland. Google is lucky enough to have the resources and experts to continually improve efficiency. But around 70% of the world’s data centers are operated by companies that probably don’t. That’s why we shared five simple and low-cost steps that any company, large or small, can use. These include using plastic meat locker curtains to separate hot and cold air, or welding your own air-conditioning chimney out of cheap sheet metal. These techniques are proven to increase energy efficiency, reduce electricity consumption and improve environmental footprint. We also announced that we’re now participating in the European Commission’s Code of Conduct for Data Centres, a framework for designing and operating data centers efficiently. It ties in closely with the way we build and run our facilities, and has a robust checklist of efficiency best practices that are well worth trying out. The main take-away was that there is no magic in data center efficiency. With the right information and a bit of creativity, anyone can make their computing infrastructure efficient. If you operate a data center or server room, please visit our website and make use of the techniques we’ve outlined. Videos of all the presentations from the Summit will be available on the site next week.